Ketupat is a Malay compressed rice cooked in coconut leave. When selecting ketupats, choose those that are as green as possible without the brown edges. This recipe makes about 30 ketupats. Make the ketupat casing using the leaves as in the video tutorial below. Rinse the rice thoroughly with 2-3 changes of water until the water runs clear, drain, then set aside to dry. 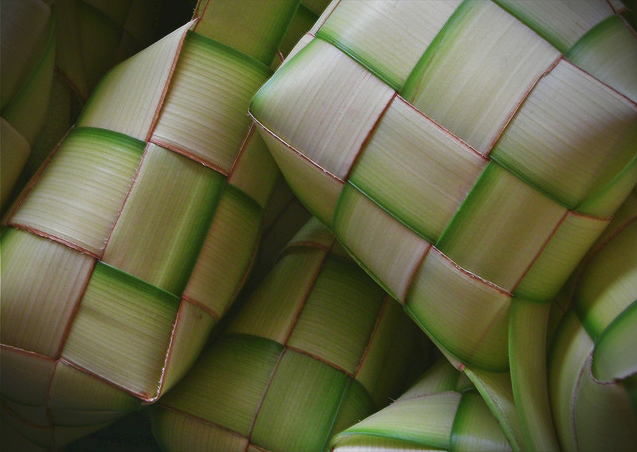 Fill up each ketupat casing with rice with about 40% full where there are two short parts of the coconut leaves jutting out. Seal the opening by tucking the jutting leaves. When all ketupat are filled and sealed, tie them together in packages of 10 to cook. Bring a large pot of water and add 3 tbsps of salt with ketupats to a boil. Make sure that all the ketupat is fully submerged. Cook ketupat for 3 to 4 hours over medium heat. Add water as needed to avoid burning the pot base. Once ketupat are cooked, remove from pot, hang dry and serve with Satay or Hari Raya dishes.